Weaving and spinning in Victoria, BC, Canada since 1934. 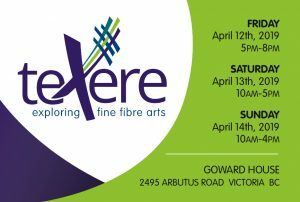 Texere, Latin verb meaning to weave, plait or intertwine, is the name of an exhibition and sale by members of the Victoria Handweavers’ & Spinners’ Guild. The exhibition will be held Friday, April 12 – Sunday, April 14, 2019 at Goward House – 2495 Arbutus Road, near UVic and Queen Alexandria Centre for Children. Opening reception will be Friday, April 12. In addition to the works on exhibit and in the Shop, there will be a variety of displays and activities to demonstrate various crafts. Share your preparations for the exhibition & sale on Instagram (hashtag #terexe19) and see what others have posted! A copy of the cards or the poster can be printed from the following links. Click the appropriate link, a new window will open with the PDF image. Alternatively, you can right-click on the link and download the file. Guild Members – The deadline to submit work for this year’s exhibition has passed. The following link is available so you can anticipate our next exhibition and be ready! – How to submit your work to the Exhibition and Sale. Visit the Guild on Facebook and Join our Private Group to ask/answer questions, arrange rides and share information. Copyright © 2019 Victoria Handweavers & Spinners Guild. Powered by WordPress. Theme: Spacious by ThemeGrill.